Clicker training involves marking wanted behaviors with a “click” to communicate to the cat what he is doing right at the exact time he is doing it. The click is always followed by a treat to reinforce the positive behavior. This type of training is now in use worldwide with dogs, cats, horses, birds, zoo animals and increasingly with humans, in the teaching of sports and athletic performances. There’s been a long-held belief that cats are aloof and independent and not capable of being trained. Karen Pryor dispels this belief in her book “Getting Started: Clicker Training for Cats.” She teaches owners how they can use this method of training to teach a cat such useful tasks as coming when called or walking on a leash as well as fun activities like sitting up and begging. In addition, the author says that clicker training can improve a cat’s health, activity level and attitude and make a household cat happier and more affectionate. 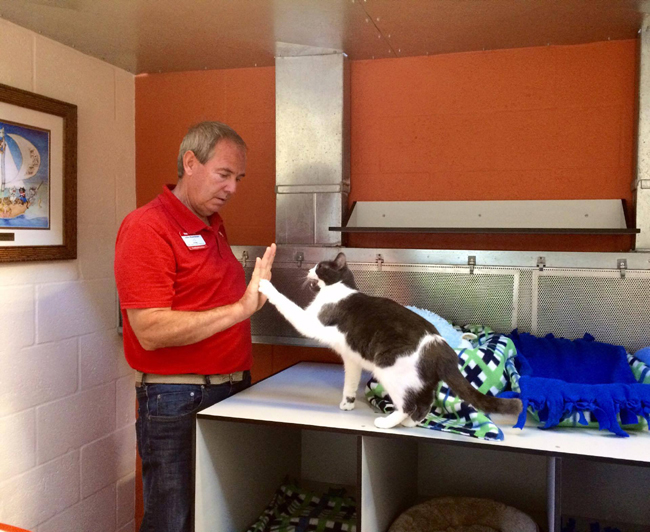 Harden said the Pawsitive Training program has made such an impact at Cat Depot that the organization plans to offer clicker training workshops for the members of the public. Educating the community, she said, will not only help keep cats happy and active at home but can prevent adopters from returning an animal to the shelter down the road due to behavioral issues. Feline behavior experts say that clicker training is the key to communicating with the family cat in a style that he or she will understand and even enjoy. By marking an acceptable behavior, such as using the scratching post instead of the couch, and then rewarding with a favorite treat, the cat learns that you will “pay” her for using the post. Some people have even successfully used this form of training to teach cats to go through an obstacle course or to use a human toilet instead of a litterbox. While clicker training does take focus, young children can be successful at teaching cats to do tricks using this method. They can also help during more advanced training sessions by feeding a treat immediately after an adult clicks. 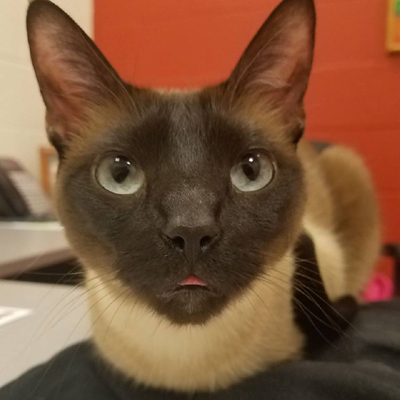 It was when Harden enlisted the help of a young boy during a training session with shelter cat, Lydie, that the Siamese-mix won the heart of her new family. “The mom was so completely blown away at how well Lydie responded to her son over clicker training that she jumped at adopting her,” Harden said. Clicker training helped Lydie to relax while living at the shelter. Lydie was chosen for the Cat Pawsitive training program because she was over-stimulated. Getting her to concentrate on the clicker helped her to calm down and to think about steps before she acted. The shelter is also using clicker training to help cats become more comfortable when entering carriers and is exploring its use in helping relieve stress during medical procedures. Not all Cat Depot residents adapt so quickly to the training. Rocket—the only cat not to be adopted from the original Cat Pawsitive training session—is an extremely shy cat who frequently hides from people. The clicker training team is working on getting him to make eye contact. Next Next post: Why do Some Dogs Adjust to Babies While Others Get Stressed?